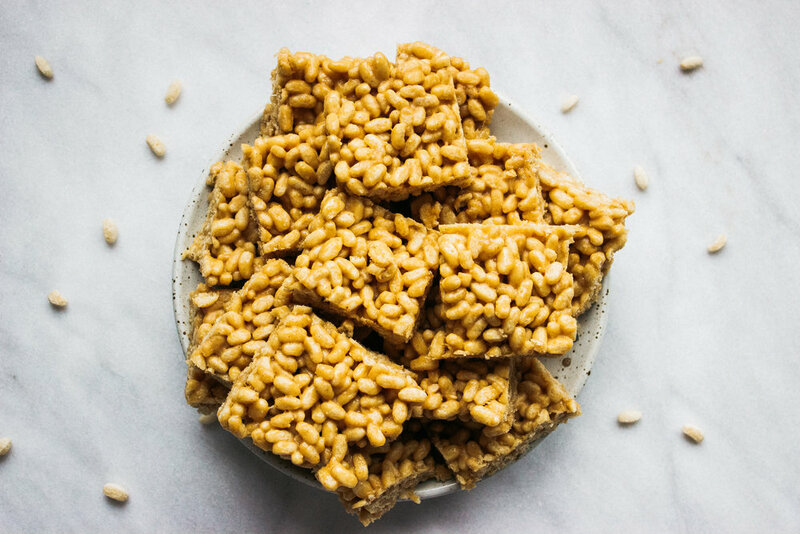 Rice Krispies, (whether in cereal or dessert form) have always been one of my favorite treats! I have vivid memories of my grandpa making them for me, my brother, and cousins, as we sat around anxiously waiting for them to finish cooling..just long enough to start pulling the tray apart. Although, you can in fact find vegan marshmallows at your local health food store, I still wouldn’t classify subbing that as a “healthier” version. 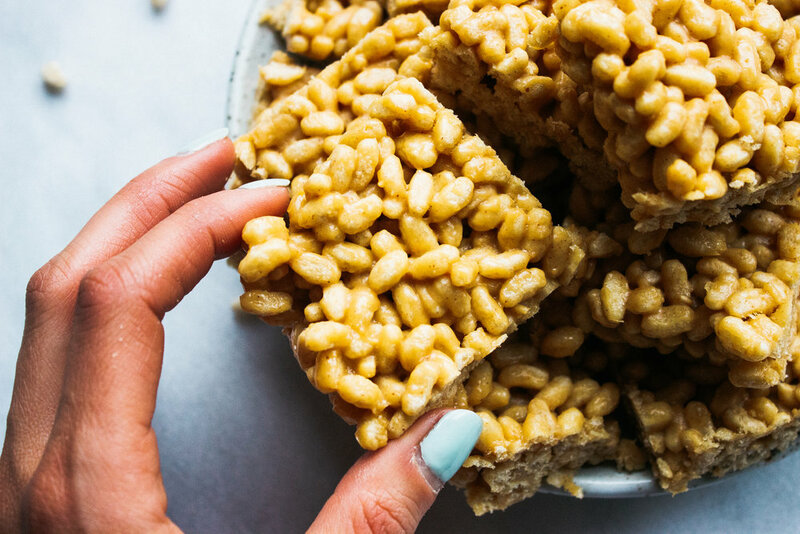 Which is why I’ve created an incredibly simple, whole-grain, low-sugar option that still gives me all the feels that I used to get as a kid! 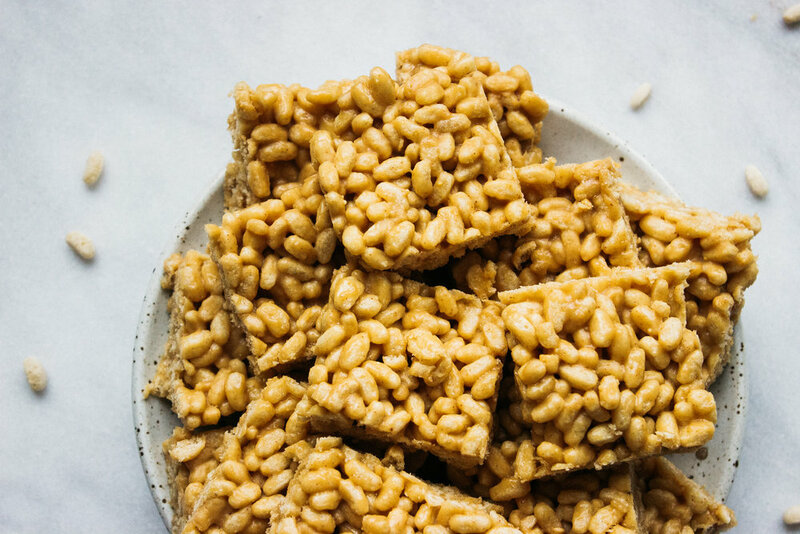 Using creamy peanut butter and sticky brown rice syrup to give these treats their classic, gooey consistency. Better yet, it requires one pan, 5 ingredients, and just a few minutes to make! In a saucepan, add brown rice syrup, coconut oil, peanut butter, and sea salt and let melt then whisk together. Next add crispy brown rice cereal, one cup at a time, until it is completely covered and all ingredients are combined. Lightly grease an 8x8 pan and line with parchment paper, then spread rice crispy mixture evenly in pan. Pressing down with a rubber spatula, or your hands using a piece of parchment paper. Let cool at room temperature, then cut into squares. Store leftovers in an airtight container for up to a week. I hope you enjoy this yummy recipe! Be sure to tag @NutritiouslyNatalie when you make them so I can see your creations!